This comet has an unusual almost perpendicular retrograde orbit which brings it into the inner solar system by a deeply southward path. It initially emerged from its remote home spending most of its time near the south celestial pole. Residents of the southern hemisphere had the opportunity to watch the comet gradually brighten as it raced toward perihelion. Beginning in early May, the comet started racing north and burst into view in the northern hemisphere when it had reached almost maximum brightness. It could be detected with the naked eye under very dark skies at the time this image was taken. The comet sported a long tail, only a small portion of which can be seem in this image. 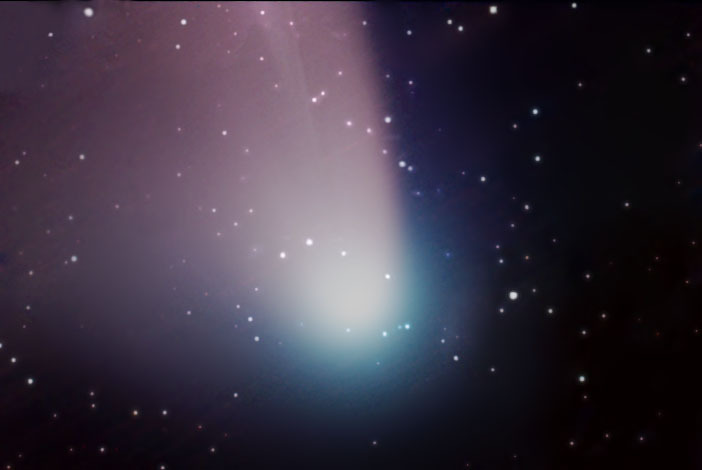 This comet was discovered on August 24, 2001 by the Near-Earth Asteroid Tracking program (NEAT). At the same time that this comet put on its best show, comet C/2002 T7 (LINEAR) was also making its appearance in the southern hemisphere. This is a composite CCD image taken with an ST-8E and CFW-8 color filter wheel using a Takahashi Epsilon 250 telescope at f3.4. The CCD was binned 2x2 for all images. This image was taken at the Sunglow Ranch, located in southeastern Arizona. RA: 09h 03m 40.5s Dec: +32d 43' 56"